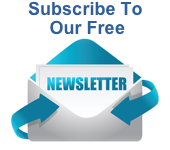 If you are looking for a complete system for 55 gallon drum storage here it is. This horizontal system is also ideal for storage. If you use it in combination with our spill pallets it meets EPA secondary containment storage requirements. Double up on storage and save floor space at the same time. All components of this 55 gallon drum dispensing system are durable polyethylene and chemical resistant. 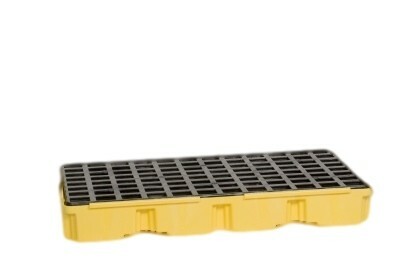 Units interlock into the spill pallet grating making it a very stable unit. The optional shelf attaches easily and makes filling containers from the drum a breeze. Our drip pans or absorbent pads are ideal to have on hand to catch any drips while dispensing. 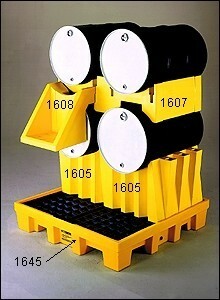 Spill pallet item A1632E works with one or two drums stacked. 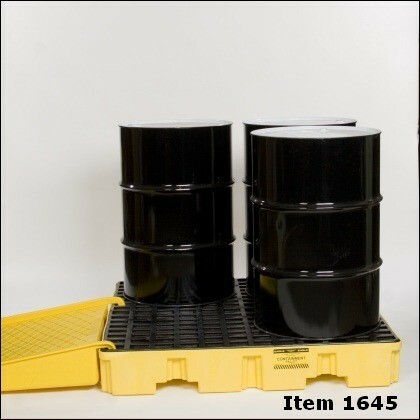 Spill pallet item A1645E work with two to four drums. Spill pallets that work with this 55 gallon drum storage system are listed below. 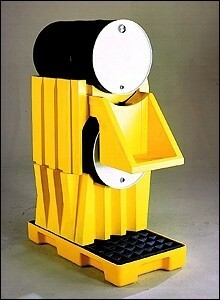 This 55 gallon drum dispensing system can be purchased in one, two or four drum combinations. Dimensions, sump capacity, load capacity and weights for each product noted below in Description.